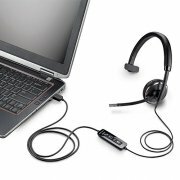 Plantronics C510 Blackwire is a corded USB headset with Smart Sensor technology intuitively help you manage PC calls. Simply put the headset on to answer a call and you’ll hear every word thanks to its premium wideband audio quality. And with ultra soft leatherette ear cushions and a lightweight headband, you’ll enjoy all day comfort and a secure fit. 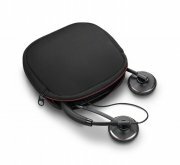 When work takes you on the go, simply fold the ear cushions flat, and store in the included carrying case. Durable and portable, The Blackwire C510 offers all day comfort for juggling PC calls and multi media providing corded reliability that’s ready when you are.